Since the arrival of 3D printers it seems that everyone is raving about the endless possibilities of these amazing devices. But it is also rather apparent that it will take quite some time before this technology becomes available on a more affordable basis. The industrial style 3D printers may be marvellous at what they do but the operational difficulties and cost of these beasts still leaves a little to be desired. So this article is all about some good news in the not so distant pipeline. We’re looking at 3 completely unique kickstarter projects that each brings something fresh to the 3D printing table. Some of these have already reached their finding targets and some are still looking for some sponsor input. Please check them out and maybe you’ll want to join in with the fun at some point – Enjoy! Our first 3D offering is a very clever piece of kit and it is already generating a fair bit of interest on kickstarter. 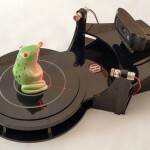 Essentially this 3D scanner works by attaching your computer’s webcam to the device and the desired object is then placed on the turntable. As the turntable slowly rotates, the lasers and software start to look for differences in the picture to detect the real shape of the object. This is repeated until the whole 360 degrees has been completed. The output is very impressive but the developers do not include the webcam, which is no surprise as they are trying to offer the Rubicon at a knockdown price. If you like the sound of this ingenious approach, why not check out the link and see if you can help them out with a small donation? Okay, we are back in the realm of 3D printers now and this bad boy is certainly going to get your attention. It has already hit 30 times its original pledge requirement and that is not hard to see why! Form1 is all about bringing an affordable and functional 3d printer to the masses and we know how desirable that would be in the real world. At the time of starting this project, the designers noted that there were no low-cost 3D printers that could meet the requirements of professional designers out there. 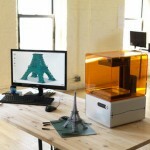 Indeed, most 3D printers were either very hard to operate or way too pricey for the small businesses. In 2011 they started work on the Form1 and have now developed the fantastic device that we’re discussing right now. You’ll get a 3D printer that is compact enough to fit on your actual workdesk and the functionality has to be seen to be believed. If you need some more information about the Form 1, please check out the links and we are sure that you will be more than a little bit impressed. Okay, this project is one of those developments that will certainly grab your attention, and then some! 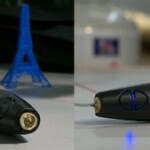 3Doodler is a 3D printing pen that really needs to be seen to be believed. It’s already received over $2 million in funding, pretty special when you consider that the original requirement was only $30k! The 3Doodler works in a fairly amazing way, and you plug the pen into an electric source and start drawing away. As you draw, the device exudes heated plastic and this solidifies very swiftly and creates a stable structure. The shape of this plastic is a replica of your actual drawing. This is a fantastic development that artists and designers will surely fall in love with. The output is obviously not going to be the finished object, but what a fantastic way to knock up some examples in the R&D meeting? You’ll also get some very clever stencils that ‘teach’ you how to make more complicated designs and thereafter you’ll start to develop your own style. The pen itself only weighs 200 grams and we believe that this is just the beginning of some amazing things to come from this stable. Well, we were and if you want to see more, simply check out the Kickstarter website and look for more 3D-tastic developments. Jenny Wadlow, the author of this article, is an employee at Artec 3D, renowned retailers of 3D CAD scanners. Jenny is an audiophile and she loves to listen to John Landrum Cooper in her leisure time.